Congratulations on your new Aussie puppy! You've made a wonderful choice in picking your "Man's best friend". 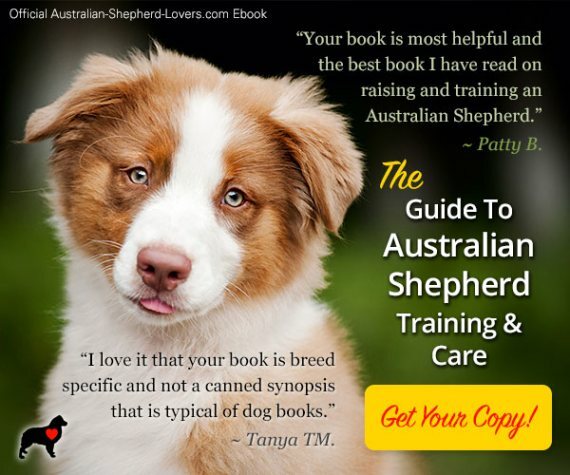 If you followed the simple steps that I outlined in "What To Look For In a Good Australian Shepherd Breeder", then you now have a healthy and well bred puppy coming home to join your family for many happy years. 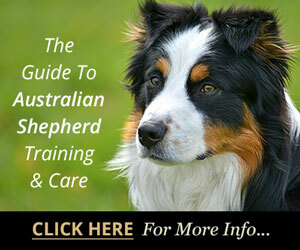 Here are a few tips to help you with new puppy care. Your new Aussie puppy is ready and eager to both learn about their new world, and please you in the process. Here are a few helpful things about new puppy care that will help both of you get off to a great start. Remember, your new puppy has no understanding of the world you live in, your family, your customs or language. Imagine if you had to go and fit into a new family with the above obstacles. Never fear, for I will tell you a secret about Aussies. The secret is, that they love to please you! So, with that in mind, when caring for puppies always praise your little friend when they do what it is that you are trying to show them. 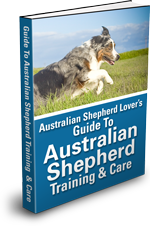 Praising them with your tone of voice, a vigorious petting or small treat, lets your new Aussie puppy know what is expected of him. And, once they understand, it takes little effort for them to integrate seemlessly into your family's life. Heck, they're more than happy to make you happy! You and your puppy have just arrived home. Let the puppy "go potty" in the yard, using a leash. Allow them plenty of time to sniff, and explore their new world. They''ll probably mark several spots. This will let them feel like the area is theirs and will seem more familiar to them next time out. This is our boy Axel at 11 weeks. 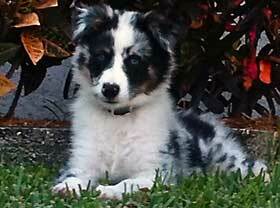 He loves to swim and fetch and play with our other Aussie Kixx. I recommend that you use a leash for the first few weeks, even in a fenced area. This helps your puppy know that you are the pack leader, and are in control. If they spend too long exploring one spot, or their mind wanders and their attention is temporarily lost, the leash will help you to quickly re-establish the leader/follower mentality with the puppy. This is very important for your long term relationship with your dog. They must know that you are the pack leader and hence ultimate authority. This will put the puppy at ease (assuming it's not an Alpha Type) and help them understand their position in the pack (your family). Praise them with an enthusiastic sounding tone in your voice and pet them vigoriously after they've done their business. This teaches them your approval of their behavior. An important part of your new puppy care is establishing this positive relationship. Don't forget... Always use a leash if you are not in a safe area. Like us, puppies at first have very short attention spans. Have a secure area that's slightly out of the way. A laundry room, the kitchen, or the garage where your puppy will spend its first few weeks with you in your home. Make sure you have a crate for the puppy. This is where the puppy will sleep. At first just have bedding and a toy or two (not one that can be chewed up easily), in the crate. The puppy will sleep well in its crate once you have established the fact that this is where the puppy sleeps at night. This is not inhumane, in fact they like having their own little den (just like their wolf ancestors). They find comfort and will usually not potty where they sleep. This is a great housebreaking tool. It also protects your house (furniture/shoes/legs of chairs/counters) and protects the new puppy from chewing or eating something it should not, and that might make them sick. You wouldn't let a toddler run loose at night unrestrained. The same is true for your little friend. If you have other dogs, cats or pets that also live with you, give some time for them to get used to the puppy. Slowly let them investigate each other. They will usually sniff each other and watch each others body language. 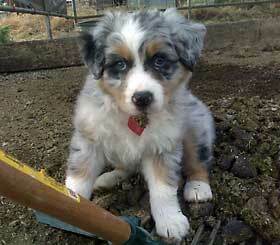 If they are like most Aussie puppies, they will be very curious about the other pet. Aussies integrate well with most anything, they just need to learn the other pet's boundaries. When it comes to integrating your new puppy care must be given to ensure they can be naturally socialized and accepted into the "pack" by learning their place in the hierarchy. Take them out to potty 5 - 6 times a day , usually more. This is a great time to teach them what to expect about relieving themselves. Five to six times may seem like a lot, but puppies have small bladders, and the act of teaching them to go outside to do their business, trains them to go to the door when they need to go out. Also, when you take them out of their crate at any time, you should take them immediately outside. This trains them to go when they get up in the mornings. It is a good way for the puppy to relieve itself and get exercise at the same time. This also helps relieve any anxiety the puppy may have in its new surroundings. This is also a good time to play with your puppy. Make up a game you and the puppy can play when you go outside. Chewing and digging problems are usually due to excessive energy. Assuming that you follow some of the guidelines above to exercise your puppy, you will eliminate most of their chewing and digging behavior. Your Aussie Puppy is in the "chewing stage" of its life, because just like humans, they teethe too, and just like us — it hurts! This is Starla at about 11 weeks old. I am currently teaching her to behave herself around my horses. She really wants to chase them. (Geez, I can't imagine why...) In this photograph, I was cleaning my horse's stalls and she decided to show the rake who was boss. She is sitting right on the rake and a fat pile of horse poo, and not a care in the world! So, provide lots of objects and toys for them to chew on. Popsicles and ice cubes are a great way for your puppy to have a treat and soothe their gums and teeth too. The chewing stage where many new puppy owners get frustrated and decide they did not want a puppy after all. Deciding what they chew is your responsibility! You're the adult, and they are the "child". As with small children, it's up to you to put the puppy in an environment that is safe for them, and won't ruin something expensive for you. Puppies explore with their mouths as much as anything, and they learn about the different textures of things by gnawing. Also, chewing makes their razor sharp teeth feel better by rubbing the super sharp edges down just a bit. The key to new puppy care is to understand how your puppy sees the world and what her motivations are. You can find lots of good things for your puppy to chew on at the Only Natural Pet Store (just search for the word "CHEW"). It is very important as a new Aussie parent for you to understand the difference between these three things. A well bred Aussie will among other things, attempt to herd infants, cats, concrete ducks, the vacuum, lawn mower, and at some point... you. At times they can be a little aggravating about it, if you forget their lineage. Herding behavior may be anything from nuzzling you continually, barking incessantly at the cat in the corner, to outright nipping at your legs or bottom as you walk. Herding behavior may show itself in brief spurts, or be omnipresent. Again, good research into what traits your breeder is breeding for, will help you avoid excessive herding behavior in Aussies bred for versatlility. When choosing a new puppy care has to be given to choosing the right puppy for your family's lifestyle. In my experience, Aussie bites are rare in pure bred animals. A true bite from an Aussie is more an extreme nipping. They scrape and bruise a lot with some tissue damage. But, nothing near the damage that a Pit Bull or other more traditional defense dog, does with their bite. At about 4 months old, and after the puppy has had its first rabies shot, you need to enroll yourself and your puppy into a basic beginners obedience class. This is my very first Aussie and his name is Widget. In this photo he was only 8 weeks. He has turned out to be even more than I hoped he would and my whole family just love him to bits! 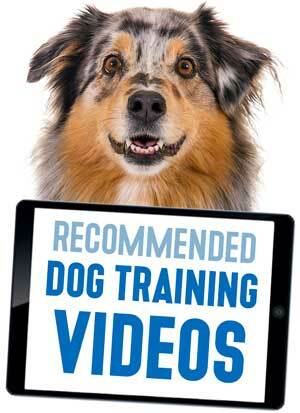 Obedience classes usually last about 8 weeks, and are lots of fun. Some clubs or individuals even offer a "puppy class". This is a great way to teach your dog manners and to bond with the new friends of the canine family. If you have kids, get them involved with your new puppy's training. 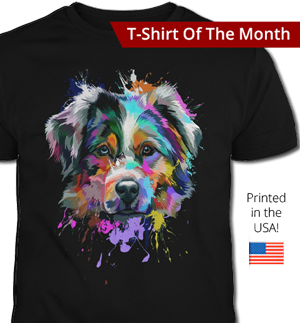 I am sure your puppy will love it. If your Aussie shows a lot of herding instinct... keep them busy with chasing a ball or frisbee. 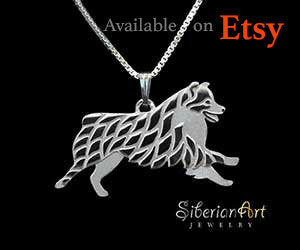 Herding classes are usually available as well. Please understand that your new puppy is very sensitive. Care must be taken to not overstimulate them. In fact, if I had to describe the breed in one word it would be "sensitive". Their very fine calibration to light, sound, your facial expressions, and many other things, makes your Aussie what they are. It is why they integrate well. They pay very close attention, and have sensitive emotions as well. They even have very sensitive stomachs and digestion. Many times, a dog has come back to us labeled as agressive, or a problem around children. A little work with the dog and an investigation has always shown that the puppy was allowed to be abused by children, usually in the form of shreiking or yelling near a puppy, especially one that is crated. New puppy care includes protecting them from your children. Striking the kennel with a plastic bat or play sword seems harmless to the child, but terrifies the puppy, and causes them to be over-excited. The first time that they are startled, they may over-react to whatever is scaring them. The owner then mistakes their puppy's fear for aggression. The owner is now terrified that the puppy will attack or bite children and wants to give back the puppy and choose another breed. The sad thing is that just a little more understanding by the owner of their new puppy's sensitivity to their environment would have kept the whole misunderstanding from happening. 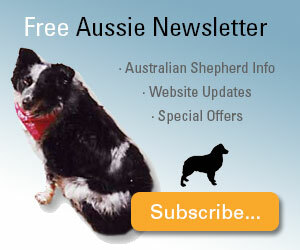 Well bred Aussies are not aggressive towards people who are not threatening them or the people that they love. Enjoy! Enjoy! Enjoy! Well bred Aussies are a joy to own and love. Taking the time to do your homework about breeders and bloodlines will insure that you have a long and happy life together. And, following the above new puppy care guidelines should help your new Aussie family member blend seamlessly into your family's life. Welcome to the Aussie family!